With 26-days remaining for the 50th Anniversary of the Minnesota Ironman Bike Ride it is always great to see members of the Major Taylor Bicycle Club and their friends, there for a day of fun. Remember there is a price increase on April 1st (no-fool’n), so if you haven’t already you may want to sign up now and save. Registration is easy. Register on-line or send us a mail-in form you can download from their website – Ride details are also posted there. All riders preregistered will receive a Ride-Day Newsletter and a rider number on or near April 15, plus a Penn Cycle/Park Tool bottle-opener. And remember, no matter how fast/slow you pedal or the distance you ride, Bragging Rights are Guaranteed! See more events, places to ride and explore in the new Minnesota Bike/Hike Guide. This entry was posted in News and tagged #FindYourNextAdventure, #onlyinMN, bike Washington County, Browns creek trail, Discover Stillwater, Gateway trail, Major Taylor Bicycle Club, Minnesota Ironman Bike Ride, MN Bike Events, Spring bike event on March 28, 2016 by Russ Lowthian. 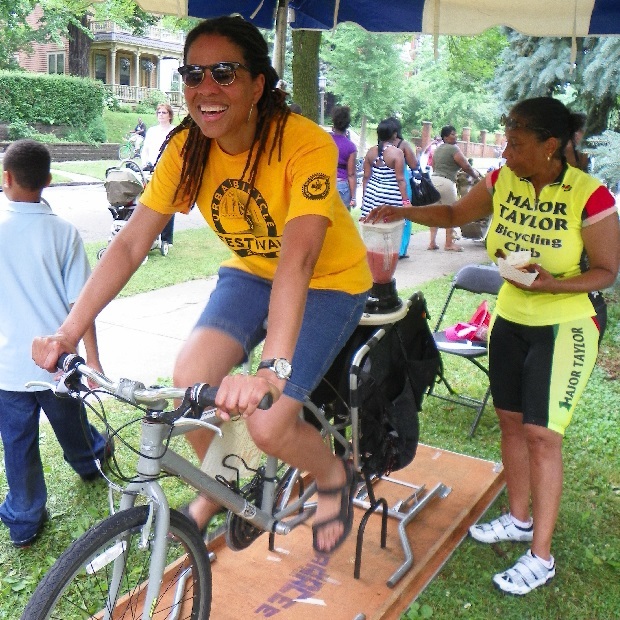 Major Taylor Bike Club, of the Twin Cities, knows how to have fun. When they aren’t riding, someone is pedaling cool drinks as the photo above demonstrates. This entry was posted in News and tagged #findyournext adventure, African-American bicycling club, Major Taylor Bicycle Club, Minnesota bike club, Twin city bike club on March 5, 2016 by Russ Lowthian.